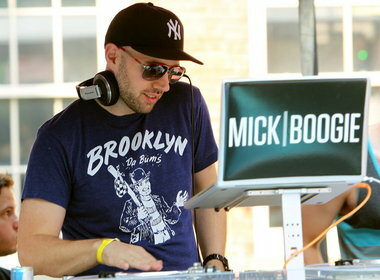 CLEVELAND, Ohio — Superstar DJ Mick Boogie gets a warm welcome whenever he returns to Cleveland, but Saturday’s was one of the warmest. On a steamy 85-degree afternoon, more than 200 swim-suited fans piled into a pool party at Barley House in Cleveland’s Warehouse District, dancing nonstop to “Fire Burning on the Dance Floor” and the rest of the eclectic, hard-driving playlist booming over the speakers. On stage above it all, expertly splicing and scratching records while sipping a Red Bull — one of the brands he gets paid to promote — was serious-faced Mick Boogie, who has built an international career that’s the envy of his peers. He doesn’t chat the crowd up; he has a strictly business way of concentrating on the turntables. But his stardom was obvious from the way that some partygoers acted like paparazzi, snapping his picture and shooting video of his fast-moving fingers on the turntables. Born Mick Batyske in a small Mahoning County town, 33-year-old Boogie has two things going for him: The ability to get people up and dancing, and a pair of marketing degrees. He bundled those things together years ago and his career blasted off — far past the Cleveland DJ booths where he got his start, to A-list parties in New York, Los Angeles, Las Vegas, Tokyo and even the Cannes Film Festival. Although he has moved to New York with wife Rana, he’s still a local hero who’s taking deejaying to dizzying heights. Boogie spins records regularly at glitzy events sponsored by entertainers, athletes and corporations like Red Bull, Audi, Ralph Lauren and Nike. “I get on airplanes and go play music and sometimes even sleep,” is how Boogie describes himself on Twitter. “He definitely showed me what a DJ from Ohio can accomplish,” said an admiring Eric Vajda, a 26-year-old from Lakewood known as DJ E-V who wants to follow in Boogie’s global footsteps. “For this career, just like he did, it only makes sense to go to a bigger city and take it to the next level,” Vajda added in a phone interview. Sometimes Boogie himself can’t fathom his luck at landing glamorous gigs like the Grammies and Cannes. “Life is just this blur of amazing blessings that some days I’m just like, ‘Wow, I can’t believe I get to do this,’ ” he said in an interview. He stays busy, handling a heavy workload. In the studio, he takes existing songs and makes them sound unforgettably new, dropping danceable beats and mixing them with other music. Then there are the free promotional mixtapes — a downloadable blend of songs like “Summertime 2,” his just-released collaboration with DJ Jazzy Jeff — that he’s always churning out. When he DJs live, he might cue up anything from Jay-Z to the Beatles to Queen to Latin rhythms. His musical sense of adventure, he said, stems from the variety of songs he heard during his childhood. He grew up in Poland, Ohio, where his dad, Richard, installed carpet and tile and mom Carol managed a gift shop. But now that he caters to a worldwide clientele, he enjoys the freedom to get playful with his music mixes. At a recent gig in Tokyo, he played house music as thousands of youth danced on a beach. At Cannes, he stirred up a blend of ’80s music and indie rock. “Some Midwest DJs only play what’s current in the Midwest,” said Arnold Hines, co-owner of Fortress nightclub who as an event promoter used to book a young Mick Boogie for his parties. Unrivaled when it comes to self-promotion, Boogie has pitched his services successfully to a long list of trendy companies, from Vitamin Water to Jimmy Choo. “He has a smart business model, the way he’s been able to promote himself. There’s not too many DJs that have done that,” Hines said. The two have remained friends, and Boogie also performed Saturday night at Fortress. Boogie said it’s his bachelor’s and MBA degrees in marketing from John Carroll University that give him an edge. “A lot of people are really creative and have no business sense, or have amazing business intuition and are not creative. I’ve been very fortunate to kind of split the difference,” he said. Another key opportunity was his gig playing music before Cavaliers games during the LeBron James years, and Boogie can’t resist saying that it wasn’t fair for Clevelanders to beat up on James for his departure. It’s simple, Boogie said: James made the move to better his career, the same reason Boogie has relocated to New York. “Most people, if they had the opportunity to improve their life and situation, would do the same thing,” he said. Today, Boogie said, he’s grateful to have arrived at the point where he can be selective, and is able to turn down chances to remix or work with artists that he doesn’t believe in. “I find myself less prone to do things just for the check these days,” Boogie said. But, he added with a laugh, if the check is big enough, he will make exceptions.